From Where I Stamp: FREE Shipping and a Colour Refresh! FREE Shipping and a Colour Refresh! Exciting news from Stampin' Up! today and you don't want to miss it! First up: FREE shipping on EVERYTHING this weekend from Saturday April 6th until Monday April 8th (excluding expedited orders)!! That's right - no $9.95 minimum shipping fee or limit on how small or large your order must be. If you need help to decide what needs to be added to your wish list check out my list of current Stampin' Up! promotions and new products! Make sure to check out the new This and That product line, our new photopolymer stamp set and the second announcement of Stampin' Up! 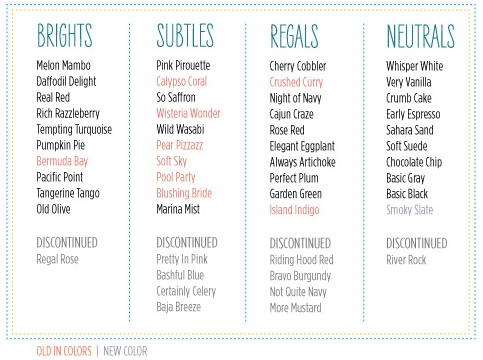 's Colour Refresh (you will want to stock up sooner than later on your retiring favourites)! Free shipping starts Saturday April 6th at 12:00am MT and ends Monday April 8th by 11:50pm MT. Beginning on today (April 4), all retiring/discontinued color products (i.e. ink, paper, ribbon, accessories, etc.) will be available ONLY while supplies last. This means that some products will not be available through the retired list period (WHICH BEGINS APRIL 24 AND RUNS THROUGH JUNE 3, 2013). 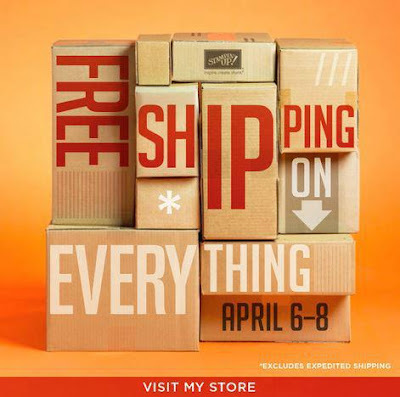 Stock up on your favorites this weekend while shipping is FREE (April 6 to April 8 - see above for the details). Make sure you place your order for those colours that will be gone soon - I know I'll make sure to have some extra Baja Breeze, River Rock and Certainly Celery card stock on my free shipping order this weekend! Place your order online with me!